and return outside air and exhaust air systems. Minimal maintenance can be expected after the installation is completed. feasible since the insulation contractor does not control this. clearance between pipes and walls for the insulation thickness specified. with the schedules of the other mechanical and plumbing contractors. 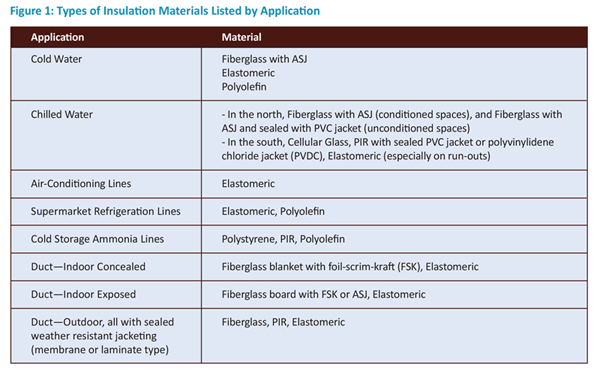 characteristics and insulation systems with a low water-vapor permeability. easily installed or will last the longest with little or no maintenance. convey their requirements to the specifying engineer. not want to mix materials on domestic hot- and cold-water applications. into account is environmental fluctuations during use in a particular space. off, causing a significant rise in indoor conditions. systems being used to reduce potential future problems. beneath the jacketing should provide a moisture vapor barrier on its own. through walls, including air-conditioning lines, chilled water run-outs, etc. transmission insulation and an additional ?low permeance, continuously sealed? jacket to prevent long-term water-vapor penetration. competitive and provide the best materials for an application.